A while ago Chem Heritage Foundation tweeted a picture of one of the drawings from Elias Ashmole’s 17th century copy of Thomas Norton’s Ordinal of the 1470’s. This reminded me that there are some differences between the original illustrations and the copies, as I noticed years ago. But good quality colour copies of the medieval pictures are hard to find. Fortunately I have tif files of the originals that I purchased from the British library for study purposes, so I can tell you about them but not put them up here. Instead you’ll have to do with low quality pictures. Note that Norton seems to be about to kiss the book proffered to his lips. The original picture has two books being offered by the wise man, and the upper one is approaching the kneeling mans lips, it isn’t that definite that he is intending to kiss it, in my opinion; maybe it is being proffered to his close lips for the symbolism with the wording in the picture. Moreover this Ashmole edition is in black and white, missing the bright colours of the original. Expecta Dominum, viriliter age : et confortetur cor tuum, et sustine Dominum (Psalms 27.14) = Expect the Lord, do manfully, and let your heart take courage, and wait for the Lord. Secreta Alkymiae secrete servabo = I shall keep secret the secrets of Alchemy. Accipe donum Dei sub sigillo sacrato = Accept the gift of God under the sacred seal. Oddly, someone seems to have made a coloured version too, in Ashmole 971 in the Bodleian library, which has made copies of the images available online. This one appears to match that of the original more generally in colour, but seems to be even more crudely drawn. It doesn’t have the naked women on pillars that the black and white printed version has. It also has an angled tiled floor, unlike the printed one and the original. The original has proper mediveal gothic pillars, but no lions heads at the top, unlike the later copies. I do wonder if the coloured version is based on the black and white one, or is it the other way around? There are white birds with halo’s in all of the illustrations. In the original the supplicant is kneeling on a blue cushion which has the usual fluffy bits at the corner of it. In neither of these is the case, and the supplicant seems to be wearing a gown more suited to the 17th century. Despite copying a lot of the original illustration, the clothes are rather different, although the master has hat in them all, and the supplicant is bareheaded. There is a fourth variation of the illustration, that found in the Ferguson collection one, which dates to the 16th century and thus only 30 or a hundred years after the original was produced. 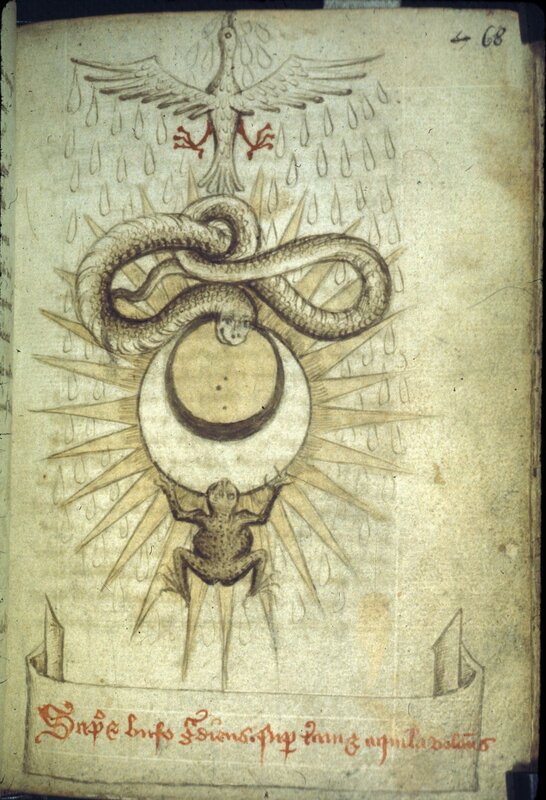 It is also crudely drawn, and appears not to have been finished, insofar as the margin of the page is blank, where in the Ashmole black and white drawing it is full of plants and animals, which mimicks the original which has somewhat abstract plants around it. But it does more closely match the original picture, in ouline, in the clothes the men are wearing, in the architecture about them, in the two books, one red and one blue being presented to the supplicant. Now, the bigger question is of course why bother copying the original so nearly yet not quite? One less book, showing even more reverence to it and the seated man, and did all the colours mean anything? I suspect that Ashmole was consciously updating a lot of the real and perceived symbolism in the pictures, hence the changes in fashion. Perhaps too him or his illustrator had not really had a chance to look much at the original picture. The fact that they have tiled floors and very similar presentations of the angels holding texts in the Ashmole copies suggests to me that the illustrators had seen the original one; if they had been working from the Ferguson collection one they wouldn’t have put the tiling in since it is missing in that one. Weirdly, Reidy seems to have missed the Ferguson copy, http://special.lib.gla.ac.uk/manuscripts/search/detail_c.cfm?ID=8345 and he lists only 31 manuscript editions in his transcription and explication of the Ordinal. The Ferguson MS is a generation or two later than the original illustrated ones he mentions. 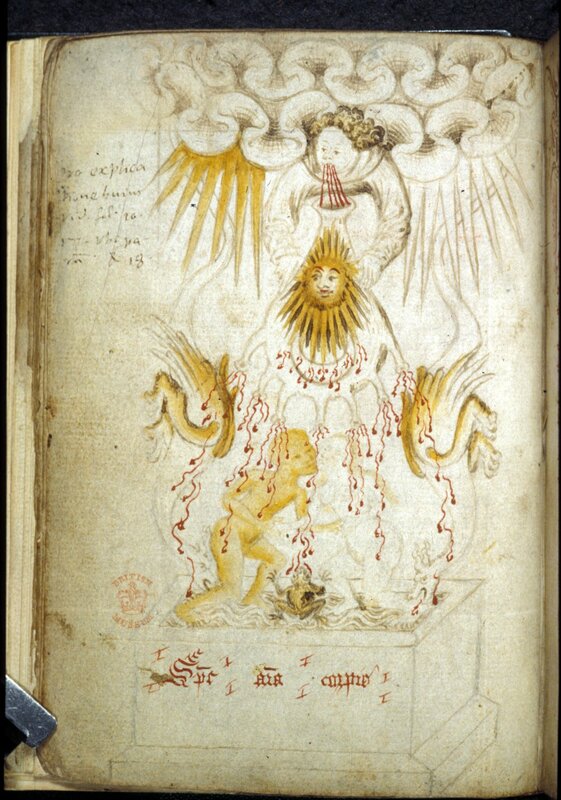 In fact, thinking about the illustrated versions that were around at the time, Norton’s Ordinal has to be one of the earliest expensive presentation alchemical works in England, if not Europe. There was a great flourishing of them in the 16th century, but not so much in the 15th. And what did Norton gain by such expensive acts? A modicum of fame, certainly, within some circle of people, but it is unclear now how much that circle was courtly, noble, scholarly or what. So many possible answers, but we don’t have the evidence to tell the wheat from the chaff.